Good Condition. Drives Well. 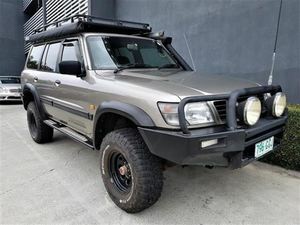 Great Off Road Vehicle 4.2l 6cyl Turbo Diesel 4x4St Patrol In Manual. Good Condition Inside And Out. Panels Are Straight. PaintIs Good. Interior Is Good. Electrics Work Well And The Air Con Is Cold. 390,000Km – Drives Well. Extras Include Solar Panels On The Roof With Battery InBoot, Dual Batteries Under The Bonnet, Sub Fuel Tank, Goodrich Mud TerrainTyres, Bull Bar, Side Steps, Roof Cage, Tow Bar, Cb Radio, Snorkel, Turbo Timer, Led Rear Lights, Led Interior Lights, Ceiling Storage And A Pioneer Touch ScreenStereo. Has Qld Rego Until 10th March 2018 And Has A Current Qld Rwc. No Hail, No Written Off, No Flood. Clear Title (no Money Owing).